Well, the boys have grown up a bit, and so has their sound. We featured the guys of Capitol Risk last year and saw some amazing potential. Their latest release, Sampler, Volume One, didn’t disappoint. The guys are just begging to be added to your summer playlists, with tracks that are one part introspection and two parts fun. The band are masters of the youthful, playful sound that will have your toes tapping and get you singing along in no time at all, while still providing substance, catchy melodies, and raw emotion. The CD offers a nice variety, from ballads like “Packing Up My Thoughts” to energy-infused tracks such as “On Your Mark” (which is also a great display of Vince’s vocal range and abilities beyond being just another random emo or screamo “kid”). 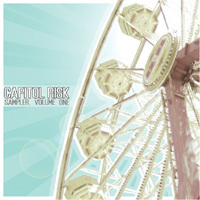 Capitol Risk has grown both lyrically and musically with Sampler, Volume One, and have proven that they’re not going anywhere but up. Expect these guys to remain a fixture in the Philly-area scene.